Three members of the Tamil Eelam Auxiliary Force were injured at around 12pm on Thursday when the Sri Lanka Army (SLA) Deep Penetration Unit (DPU) exploded a claymore mine in Semamadu, Vavuniya. 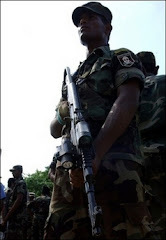 DPU activities in Liberation Tigers of Tamil Eelam (LTTE) administered Vavuniya region died down after the assassination of Major-General Parami Kulatunga in June 2006. The Auxiliary Force members were engaged in a regular road clearing operation when the mine exploded, LTTE sources said. Earlier in the year, SLA DPU had killed several civilians traveling on roads in the region.